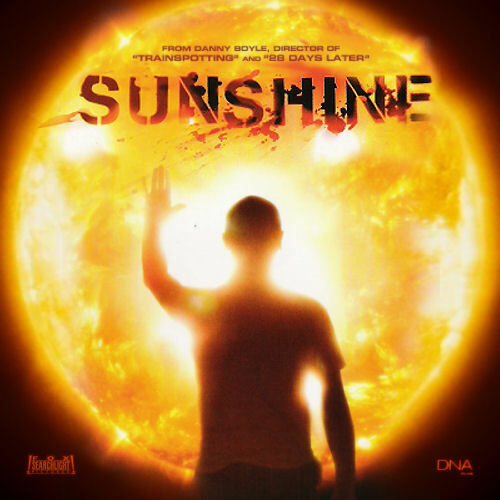 Getting hold of the soundtrack to Danny Boyle’s 2007 Sci-Fi Thriller Sunshine was a task almost as impossible as the one the film’s protagonists had to complete. For over 1,5 years, until the score finally got it’s official release on iTunes, I was searching for a promo score or at least a proper audiostream from the DVD source. I spent literally months scouring through the IMDB boards, different fansites and countless soundtrack forums. I even went through the whole Underworld discography, only to find one or another snippet of music that’s been used in the film. Yes, I was in love… Sunshine became one of my all time favourite scores and coming to creating soundtrack covers, I promised myself to – compared to the score release – make it shine. Like a star in the sky. Without the boundaries of an origial soundtrack cover, artistically speaking I could let myself go completely. Sunshine is by far one of the most astonishingly beautiful films in recent time. I could literally screencap the whole film and make custom art out of it. Funnily enough, that’s exactly what I did for the first custom cover (#1). First I’ve imported myself the Hong Kong Limited Edition DVD from YesAsia (which is completely out of print by now), mainly because I wanted to scan the cover art and make a custom cover out of it. It kind of worked, but it always bothered me, that the Sun was a bit battered. So – a few years later – I’ve grabbed me the by now published Blu-ray and started taking screen captures. I remade the whole thing, applied the character of Searle in the middle from my scanned DVD cover and also revamped the whole album credits. Now the Sun is completely round and as hi-def as it gets. I’ve made a few screen caps trying to find the perfect moment with the right amount of lens flares and reworked that into another custom cover (#2). It was the last cover I created for Sunshine and wondered afterwards, why I hadn’t thought of this idea earlier. The rest of the bunch is mainly based on various posters and wallpapers (#3 to #6). I’ve paid particularly attention to find the right font type for the album credits and even gave it a slight colour gradient. As a late addition to this series I’ve created a Complete Soundtrack (#9) as well, since I was expressly asked to do so. Normally I don’t like this sort of naming, but I couldn’t say no to a request like that. After all it’s Sunshine we’re talking about. This custom is based on an epic image created by deviantArt user “Physco-Matter“, who kindly gave me permission to use it. To complement this entry, below you find all the official artworks, including the god-awful soundtrack cover released by Fox Music Group (#11). I guess someone there was really pissed, that it took so long to release this gem. That’s the real image by the way, I’m not kidding! This is how Fox released the album to the public. It’s a shame. There are so many things wrong here, I don’t even wanna start complaining. Somebody on AlbumArtExchange posted a remake of the official cover, which fixes a few things (#12). But regardless of the improved image quality, the design is still poor. This whole series was clearly a labor of love for me. Lately I’ve played with the thought of making a digital booklet for the film. My artist fingers already start itching when I only think about it. Expect it to go online sooner or later within this posting.